With temperatures finally starting to come down, it’s time for area girls cross country teams to get back out on the track. The common theme across the board is the loss of some strong runners to graduation. But there is still a lot to look forward to for each of the six teams. Berlin should be the top area team again this season. After a near-perfect season in 2017 and a large number of returning Redcoats, there’s a good chance they’ll be leading the pack again. Southington, Newington and Plainville are also looking to take a big step forward this season. Though all have young teams, they also have some veterans that could help lead and develop the inexperienced runners. Both New Britain and Innovation could have their fair share of struggles this season. Though the coaches are excited about the young crop of talent, it will be a rebuilding season for both programs in an effort to gain experience for the inexperienced runners. Outlook: There are many questions surrounding the Hurricanes this season. Much like the boys team, the girls are a group of many inexperienced runners with few miles behind them. There will be a lot of pressure on older runners, including senior Jamie Kelly, to help lead the squad, especially in the earlier meets of the season. It looks to be a rebuilding year in New Britain this season. Outlook: All signs point to a strong season for the Blue Knights this year. With none of its starters graduating, Southington will rely on its core of runners to take another step forward this season and establish itself as one of the strong programs in Connecticut. Two key runners for the Blue Knights are Grace Michaud and Jackie Izzo, neither of whom were on the team last year. Head coach Dan Dachelet sees Michaud potentially as one of the top three runners on the team. Izzo, on the other hand, could be one of the best freshmen in the state, according to the coach. There could be a lot of excitement surrounding the Southington girls this season. Outlook: The Redcoats have been one of the best teams in the state for years, and there is no reason to think that will change this season. 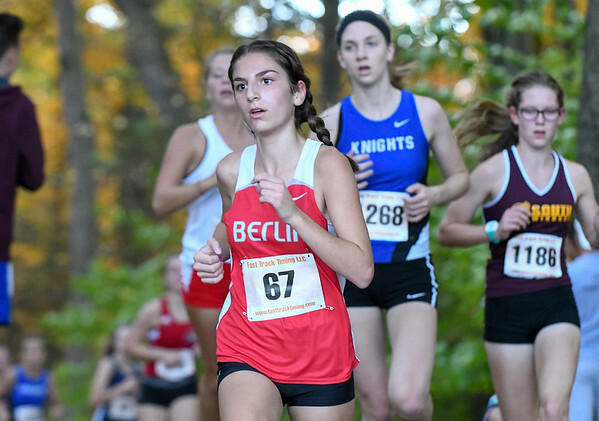 Despite losing some of its best runners, Berlin has a solid group returning, including All-State honoree and New England meet qualifier Juliana Cancellieri, senior captains Alexa and Madison Monroe, plus Megan Perrotta. The girls are the reigning CCC South champions and head coach Steve Soucy expects his team to repeat this season. Outlook: Though the Blue Devils have a young squad coming into the season, there is still plenty of excitement surrounding them. Between the girls and boys, it is the largest squad in coach Shaun Berard’s tenure. Plainville is only losing Taylor LaPira to graduation, so many of the faces are not new. One runner to watch is Amy Muller, who has been running strong this summer, according to Berard. The only question that remains is if some of the younger and new team members can step up and have strong seasons. Outlook: Things will shake up for the Indians in head coach Jen Deschenes-Emord’s second season at the helm. Many of Newington’s key runners graduated last season, but there are several young runners who are ready to step up and take the reigns. Kassidy Doyle, Maddie Gentile and Julie Robinson are three of Newington’s best runners - and all are either sophomores or juniors. Newington is in a strong position to have a strong team this season and for several seasons to come. Outlook: The Ravens are looking to take a big step forward after a rebuilding season in 2017. Innovation lost four of its top seven runners due to graduation, so head coach Bryan McCain will have his hands full filling those voids. Still, the coach is excited about the potential of some of his young runners. Posted in New Britain Herald, Berlin, Innovation, New Britain, Newington, Plainville, Southington on Wednesday, 5 September 2018 20:54. Updated: Wednesday, 5 September 2018 20:57.